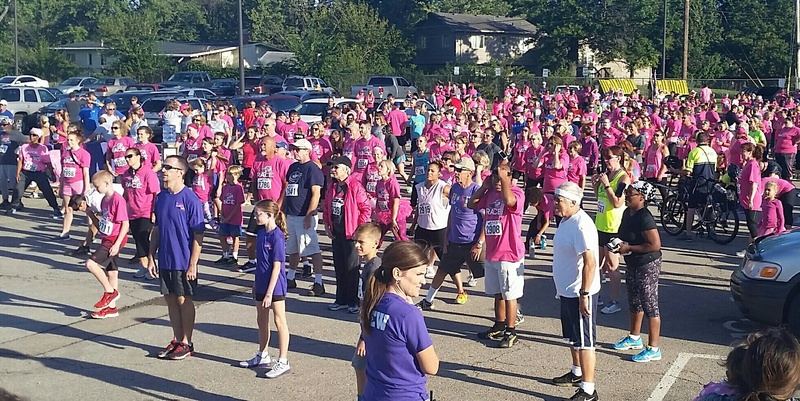 Mark your calendars for our 28th annual 5K fundraising event on Saturday, October 5th at Topeka West High School! We are pleased to announce our honorary co-chairs for the event – Robert Kenagy, MD, Stormont Vail Health CEO & Steven Anderson, The University of Kansas Health System St Francis Campus CEO. Join us for a morning of fundraising for the RABC and local no-cost mammograms! We will have a silent auction, merchandise sales, our 5K run/walk and Pink Out Color Fun Run event. Watch this page for more updates to come! Interested in being a Sponsor? See this Sponsorship Form for more information. All 5K Runners must wear the race number provided and wear their assigned runner chip bib in order to receive their race time for the 5K event. Overall 5K awards will be based on clock time; age-group awards will be based on chip time. 5K Runners are not allowed to push strollers or run with dogs. 5K Walkers may push strollers, pull wagons or push wheelchairs (with participant secured while on course), but they must begin at the back of the walker group. Children in strollers/wagons must be secured in stroller/wagon at all times while on the 5K course. Children not in strollers/wagons on the 5K course must have a paid registration. At 5 kilometers (3.1 miles) long, this USA Track & Field Associated certified course begins on Belle Avenue, just north of 21st Street, and travels through a nearby residential neighborhood. Splits will be provided at the 1-, 2- and 3-mile marks and a water station will be at the 2-mile mark. The Race Against Breast Cancer will honor all breast cancer survivors registered to participate in the 5K event with a complimentary gift.